With great trepidation I decided to take a week off ‘reading’. The idea being that it can be a way of avoiding life sometimes. Being a busy mum I don’t get much chance to read, so I thought about what I do read. Mainly it was Facebook groups, my friend’s Facebook updates, twitter, and a couple of online newspaper pages. So I decided to unplug for a week. I’d reply to people, mainly because otherwise I’d come back to a confusing mess. But apart from that I wasn’t going to spend time surfing online. What would happen? I worried I might miss something important in the news. More importantly, what if I missed something in a friend’s life? Oh no, how would the world survive without me?!! Well, it appears it survived just fine; surprisingly! It’s OK to let other people interact with you on Facebook and twitter, rather than make sure you are creating the interaction all the time. It’s OK to take some time off when you’re busy and come back later. By not surfing anything on my computer I was more up to date on my to do’s by the end of the week. In fact I got a burst of energy and managed to give away a boot full of children’s clothes, find a nursery for Little Dimples, find a cleaner (yeeehaw!!!! ), sort out my diary, buy and sell cars, make an exercise schedule for me and the big hairy northern one, and loads more things. I get a lot of value from my online life, and I’m a big believer in making sure that I ‘give’ a lot too, but some aspects of it are less useful. The newspapers are very depressing. Some of the Facebook groups are not as useful as others. Using discernment about which updates to ‘like’ or comment on, massively reduces the amount of reading I do. 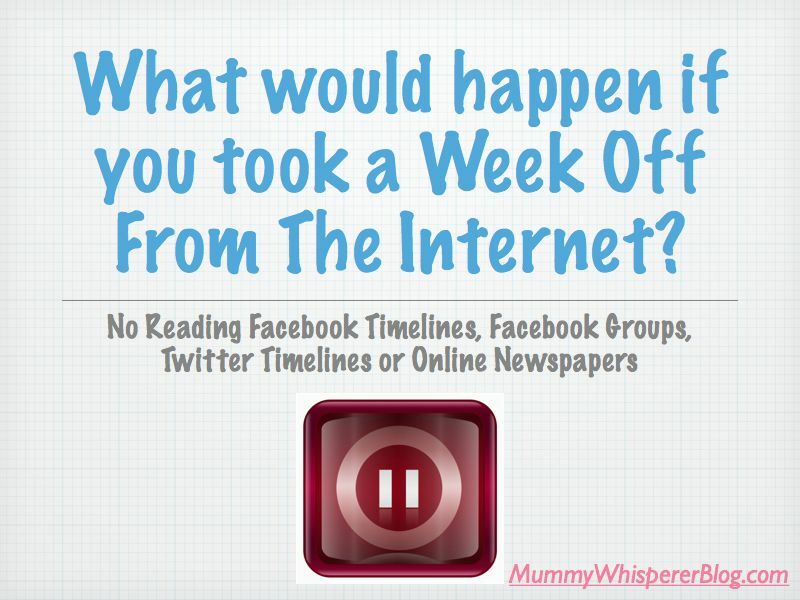 Have you ever tried to unplug for a week? If you are busy I would really recommend it as a way of going cold-turkey, reassessing your online usage, getting more done, taking some time out and rethinking your priorities. Go on, fancy trying it? Let me know what you think! I’ve just been unplugged for two weeks due to no Internet or mobile access on holiday (*shudder*). It made for a really pleasant change. Coming back, I’m surprised by how much pressure I put on myself by feeling compelled to instantly reply to everything. I’ve come back with good intentions! Plus the end of my mat leave in three weeks’ time will enforce more separation from social media. It’ll do me good! I was allowed 20mins a day when we went on holiday last year lol! But I think I’ve got it a bit more under control now a days – I reckon I might do this again every now and again just to make sure I’ve got ‘perspective’! Good luck with returning to work lovely. I unplugged when I went to Tunisia last year, simply because I knew I would have no internet access, no current newspapers and limited news channels. I did cheat a little and I scheduled a few guest posts in on the blog but even though my stats were down (not important) no-one had unfollowed me or unsubscribed from the blog, the world kept on turning and I was still surviving without my internet fix. I do believe that we have to interact differently in this world, simply because contact is more readily available online, but going back to basics from time to time does us no harm either. It’s good to find that balance and encourage the next generation to have that balance too. I didn’t even think about people unsubscribing – oh no another thing to worry about ;o) I think sometimes I’m just a bit too helpful (but don’t tell anyone I might be a little less helpful from now on, cos then you’ll win that MADs award from me! ).